So strange to have Halloween on a Monday this year but it does allow early Halloween celebrations. 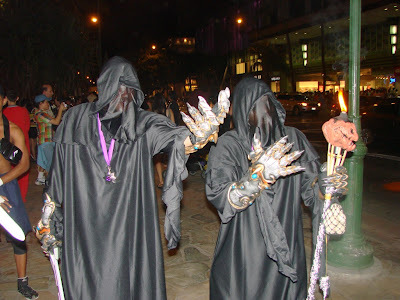 Here is a bunch of obake (ghosts) sighted at Hallowbaloo which was a block party in downtown Honolulu on Saturday. Costumes galore filled the streets of Chinatown along with booths of food and drinks and live bands playing on multiple stages. I hope all of you have a safe and Happy Halloween. 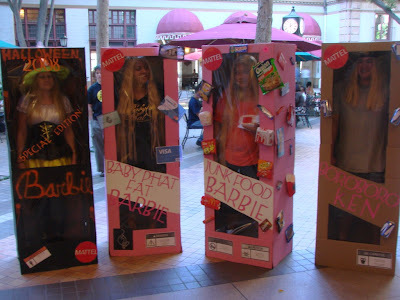 Collecting items for Halloween costumes made me remember one of the classic costumes some coworkers came up with in 2008. Here is a lucky “boroboro” Ken with three Barbies now that’s the way to live. This photo was taken at the Pacific Guardian Tower’s Halloween Party. This year is kind of strange with Halloween on a Monday so maybe things are taking place prior to the big day. When the ghost and ghouls start to stalk the streets of Waikiki you know that can only mean one thing. 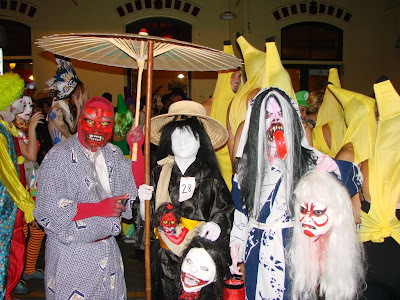 Halloween is coming to Hawaii and starting today we will run an assortment of Halloween related photos. Hope you enjoy our series as we countdown to All Hallows Eve.